Whether you need compression and support or simply a comfortable sock, choose from a variety of men's casual socks that can protect and warm your feet. You can find assorted colors and lengths of casual socks here at Walgreens.com, in addition to various sizes for a great fit. Look for men's casual socks from TruForm, No Nonsense or Rejuvenizer that will stay in place for all-day comfort. If you're looking for basic mens casual socks that don't offer compression, you can find multi-packs in one color or assorted colors. These socks can be easy to care for and are ideal for wearing with sneakers or other casual shoes. If you need compression socks, choose from different levels of support that include mild, moderate and firm compression. 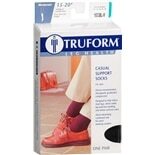 These socks can promote healthy circulation and are ideal for people with diabetes or other health concerns. 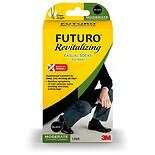 Our selection of men's socks also includes different styles of men's compression socks. There are dress socks and athletic socks available. Find knee-high and ankle-length socks to meet your needs. If you require compression over the entire length of your legs, browse our supply of compression hosiery. 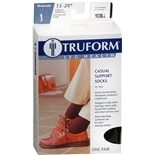 These generally are made with gradient compression that is strongest at the feet and mildest through the thigh.